An Illustrated Dictionary of Building is ideal for practitioners and students on GNVQ, NVQ Construction and The Built Environment and Building Craft Operative courses. The guide is also useful reference for those in Higher Education on Professional, Architectural and other associated courses with a building element. 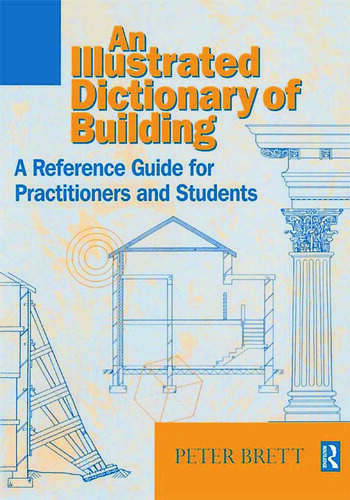 First published in 1989 as Building Terminology, this second edition has been expanded and updated to cover an even wider range of terms, concepts and new practices. Including slang and regional variations, these are clearly defined and cross-referenced, many with the aid of illustrations, to provide an insight into the building industry as a whole. The logical A-Z arrangement in each section makes this an ideal reference source. The book is also highly illustrated with over 350 diagrams and photographs. The subjects covered include: architectural style; building construction; documentation, administration and control; materials and scientific principles and services and finishes. Peter Brett was formerly a Head of Faculty for construction at Brooklyn College, Birmingham. He is now in private practice undertaking design, construction and consultancy projects. Brett is an Honorary Member of the City and Guilds of London Institute and a Construction Education Consultant, in addition to being a Chief Examiner and Assessor for various UK, overseas and NVQ schemes. Preface; How to use this guide; Architectural style; Building construction; Documentation, administration and control; General; Materials and scientific principles; Services and finishes; Alphabetical index.